Above: Grantham passed cleaners Roger Simon and Fred Harris with class A1 No. 60126 Sir Vincent Raven which was based at York shed (50A). Photograph lent by Fred Harris. 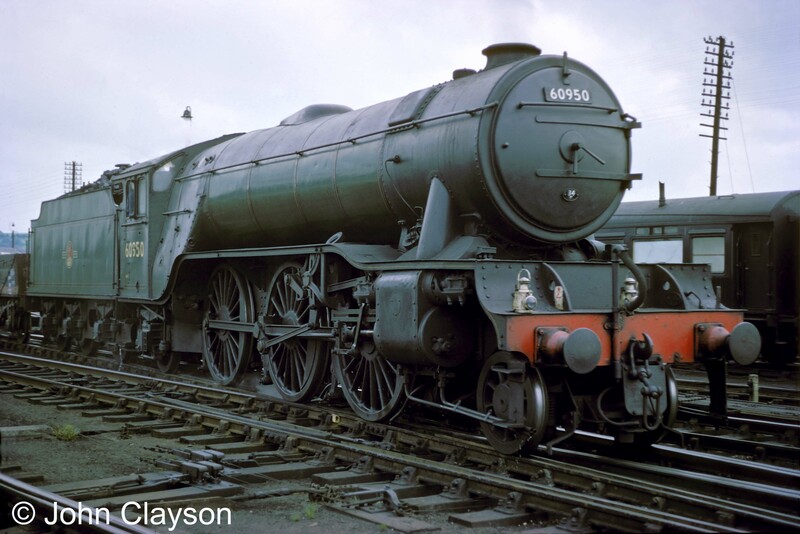 On 15th August 1955 I entered service with British Railways at Grantham locomotive depot as an engine cleaner. I was put to work under the auspices of two other cleaners, namely Alan ‘Grandad’ Grummitt and Michael ‘Burglar’ Smith. After 10 weeks or so, being already the giddy age of sixteen and having been taught the rudiments of firing and train safety & protection, I was promoted to passed cleaner. That is a cleaner who has passed tests on rules etc. and who can act as a fireman if and when required. Here I should mention that cleaners and passed cleaners were under foremen George Bott, George Goodman, or the running shed foreman on the late afternoon and night shift. ‘You must not fire on the main line until you’re eighteen,’ we were instructed. However, being short of staff I fired for Driver Austin Brown when I was only just turned seventeen, on a parcels one-way trip to King’s Cross (…if needs must!). I was firing once with Norman Rilett on a special King’s Cross return passenger trip with a rough-running V2 ‘Green Arrow’ class. On the return trip we were passing Holme when the middle big end parted company with the rest of the loco. The middle piston went through the front of the cylinder. Now we knew why the loco had only about 4½ beats, not 6! Norman let the train drift to a halt – a very rough and alarming ride. He did not want to make matters worse by using the brakes until the speed had fallen. We stopped in the middle of Stilton Fen and it was time to carry out protection and arrange for rescue. It was a fair walk forward to Yaxley signal box for me, laying dets (warning detonators) on the way. Single-line working was put in place on the Up Main line. The coaches were pulled back. I had to conduct the breakdown train from Peterborough to a point near the failed loco. using a green ‘Wrong Line Working’ form. This was the only time I failed completely with a steamer. Parts of the middle big end were later found on the line. One cotter pin was stripped of its thread, and the other had sheared in half. After rescue, on arrival at New England depot (Peterborough) the Chief Mechanical Engineer’s man, Mr Young, remarked rather sarcastically that he supposed too much water was in the boiler (which, at speed, could have a similar effect). He was quite firmly corrected. Class V2 locomotive No. 60950 of Grantham (34F) shed gets its northbound Class C fully fitted freight train under way, passing the north end of the station, probably on June 21st 1962. This is the type of locomotive that featured in the incident recalled above. Photograph by Cedric Clayson, © John Clayson. Other duties, besides cleaner and part-time fireman, included time office runner, pit labouring and frost fire attending during winter. One pea-souper of a Monday morning at 2am Driver 'Ma' Brown, with me as fireman, set off from Grantham for Doncaster Decoy with a loose-coupled goods of about 60 various wagons (maximum 35mph) pulled by a 'Tango' (a Class O2 heavy freight locomotive). We found Barkston South and North signals all clear, followed by Hougham. Next was Westborough, with lone semaphore distant and stop signals. We craned our necks and strained our eyes, crawling along at about 5mph, but saw no sign of signals nor signal box. Eventually we came to Claypole, signals all clear, so carried on. We must have lost considerable time. Back home at Grantham Loco, upon reading the applicable notices we found that Westborough Box and signals had been removed that Sunday! We'd signed on at 2am on Monday. Lesson learnt - read notices before a trip, not after. Class O2 'Tango' locomotive No. 63931 of Grantham (34F) motive power depot is travelling north tender-first through the station on June 27th 1963. Later in the afternoon it returned south hauling empty ironstone wagons. Baskets for carrying racing pigeons are piled up on the barrow on the right. On 16th October 1962, I was promoted to full fireman in the care of Driver Roger Hunt, mainly on ironstone trains with 'Tango' and 'Austerity' locos. 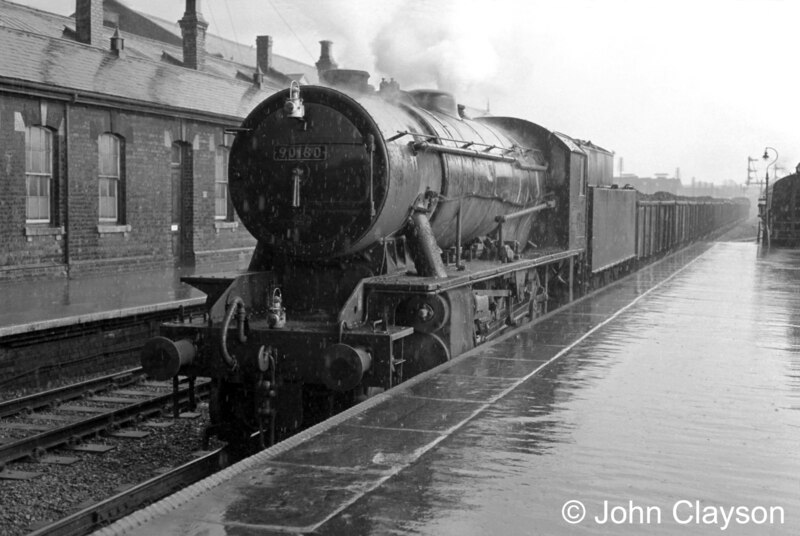 On April 18th 1963, a day of heavy seasonal showers, class WD 'Austerity' locomotive No. 90180 of Immingham (40B) motive power depot trundles through Grantham from High Dyke, bound for Scunthorpe with ironstone. These locomotives were known as the WD 'Austerity' class because they were a basic 'no frills' heavy freight design built in very large numbers for the War Department during World War 2. Many were shipped abroad - for example, to the Middle East. 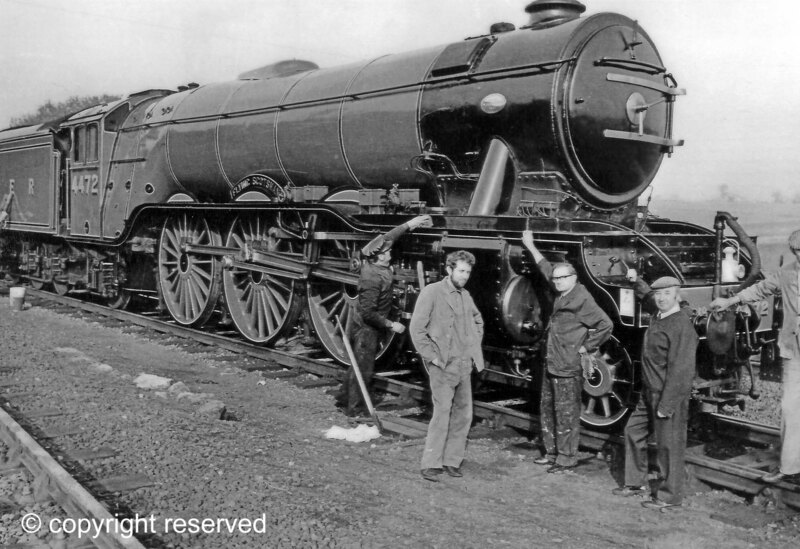 Of those that remained in Britain, or were returned from overseas, most were taken over by British Railways and they could be seen at work in many parts of the country until the mid-1960s. Whatever else, Roger was a first class driver and I thank him for the knowledge and experience he passed to me. In September 1963, due to the rapid introduction of diesel power, mass redundancies became rife with many staff leaving the industry. With the closure of the Loco I, along with 30-40 other Grantham firemen, opted to transfer to another depot. I ended up at Stratford in east London. The pace of London life was too hectic for me (everyone was in a high-speed time warp, or so it seemed). Yours truly is a country soul at heart. So it was with relief that about 10 months later, in 1964, I was thankfully relocated back to Grantham. What a change! No ‘Loco’ and no Loco offices, just a signing on point and mess room on the station. Freight traffic was also being so-called ‘modernised’, ‘wagon load’ being axed in favour of ‘block load’ trains. Thus many – in fact nearly all – small yards were closed and the tracks pulled up. Grantham traincrews relied mainly on traffic from the iron ore branch at Highdyke (Burton Lane, Colsterworth, Stainby and Cringle and Sproxton, plus Skillington Road Holding Sidings). Trains were assembled at Highdyke sidings. The majority were for Frodingham steelworks – entrance E, but a few went to Parkgate near Rotherham. Now and again we worked the Belvoir/Woolsthorpe – Harlaxton – Denton branch, though this was mostly worked by Colwick crews. Another story. Driver N. Rilett and Secondman F. Harris were sent with a Class 47 engine to run tests with loaded wagons in and out of Colsterworth North Sidings – VIPs etc. were everywhere. All went well at first. However, the faux pas came at about 20 wagons, what with very tight curves and the very small spindles attaching them, both buffer plates snapped off (rather neatly, I must say). Back to ferrying with Class 31s to Highdyke Yard to assemble trains. An iron ore tippler empties train hauled by Brush Type 4 (later class 47) diesel electric locomotive No. D1506 has stopped at the south end of the station for a crew change on Friday August 30th 1968. Driver Bill McGee is on the right. With the class 4 headcode the tipplers would be vacuum brake fitted. I passed for driving on 10th November 1972. On 30th October 1973 I was fireman with Driver Fred Burrows when we took No. 4472 Flying Scotsman out of Grantham to High Dyke and then up the branch to Stainby Sidings. The train then carried on along the old ironstone lines to Market Overton. Guard Dennis Flear and Assistant Area Manager Paul Needham came with us. No. 4472 Flying Scotsman at High Dyke sidings on 30th October 1973 with members of the two crews responsible for delivering it from Grantham to Market Overton: a Grantham BR crew, from Grantham Up sidings to Stainby Sidings, and a Flying Scotsman Enterprises crew onward to Market Overton. Photograph by The Grantham Journal, lent by Fred Harris. Both ironstone branches closed in around 1974, resulting in redundancy once again. On 14th April 1980 I transferred to Peterborough. In the summer period there were 4 junior staff on the books and they were carried during the winter as surplus staff. I was LDC (Local Departmental Committee) Rep. during this time (I was also Health & Safety Rep.) and I found out that this would end in summer 1980. This was ‘inside info’ from management – LDC did have its uses. I advised my colleagues to consider transferring. Thus it was that four of us ended up at Peterborough in the spring of 1980. This came as a bit of a shock – rest day working and two Sundays out of three. A good increase in overtime pay, but no time for much socialising. I was promoted to driver on 15th April 1985, nearly 30 years after I began my ‘apprenticeship’ – hence the title. I drove for Main Line Freight and EWS. 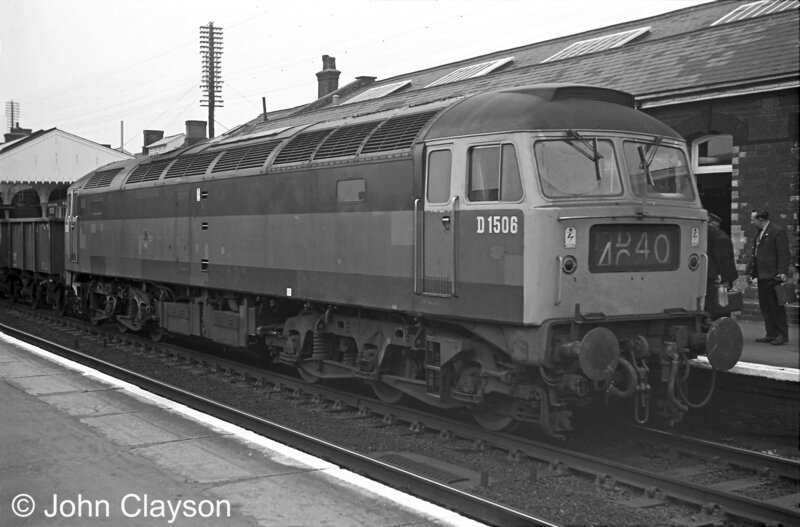 Diesel Railcars: 105 (Cravens), 114 (Derby Heavyweight) etc. A class 31 diesel locomotive and train at Nottingham Midland station, with Fred Harris at the controls in the driver's seat. Photograph sent by Mick Barstow. Nottingham to Trowell, Erewash, Clay Cross and Sheffield. Not bad for a Grantham Lad! ...it was decreed by Network Rail. Therefore Driver W. Watkins and I, both of Peterborough, and Inspector Jim Smith of Thornaby were sent, courtesy of EWS, for a refresher course on the Severn Valley Railway. We were allocated a few coaches and old LMS engine No. 2968 owned by the Stanier Mogul Fund, all in very good condition, along with their Chief Traction Inspector Bernard Rainbow an absolute gem of a steam enthusiast. We all had a glorious week. Thank you Railtrack, all the Severn Valley staff and especially EWS who paid the bill! We lodged at Bridgnorth with a lovely landlady. She advised 'Have the meal of the day to save me extra cooking and I'll supply you with 2 pints of ale.' We accepted! We kept our steam tickets throughout our careers. I retired on 17th January 2004 from EWS. I had opted for freight in EWS so that I could continue working with steam as both fireman and driver. What a great story. 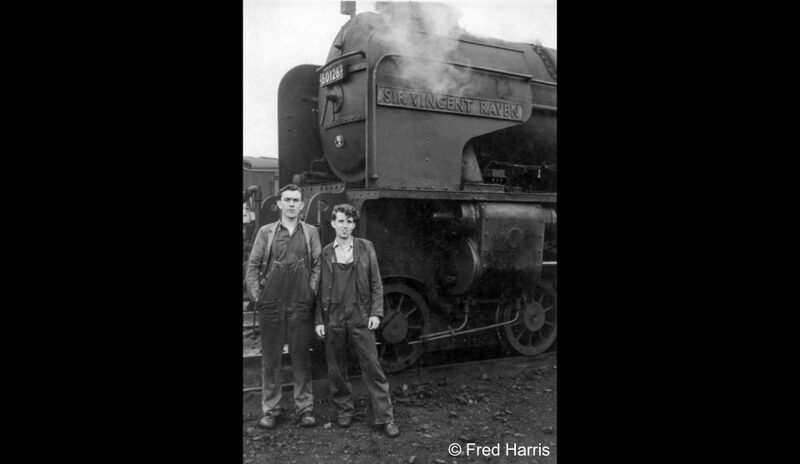 My grand father was a Fireman on the Flying Scotsman, Mr George Herbert Mead, and I am trying to find any information or photos. I know it was post WW2 as he was a Tail End Charlie in a Lancaster but I'm not sure how soon after it was. Any information or a nudge in the right direction would be much appreciated.